This file is for informational purpose only since without the past the would be no future. Applications include private use, commercial passenger carrying, search and rescue, military patrol and military command and control. Survey to international standards is available. The 'Mustang' has an optional fully enclosed cabin with heating and air-conditioning; cabin access is provided by twin gull wing doors. Controllability and efficiency have been enhanced by the installation of a twin ducted thrust system with power assisted elevators. This unique system has been well proven on our larger Pioneer model and has no parallel when it comes to the ease of dynamic pitch and roll control. A proven, fuel injected General Motors V6 provides ample power for all systems through parallel hydrostatic transmissions. Wherever possible 'off the shelf' components are used in engineering the Mustang's mechanical systems. Careful matching of the component capabilities and craft requirements provides a well balanced mix of components reducing the use of specialist items. Skirt cushion height at bow 360 mm 14"
Skirt cushion height at stern 310 mm 12"
Isolated obstacle clearance 335 mm 13"
Engine 3.8 liter V6 GM with E.F.I. The hull, deck and superstructure are a vacuum formed laminated sandwich composite with a PVC core and high tech knitted bi-axial fabric reinforced resin. This construction has superior stiffness and is very tough. An excellent strength to weight ratio and very low maintenance requirements are also achieved. In the event of damage, the hull is easily repaired. Thermal and sound isolation properties are excellent for this construction system. All laminating is conducted with active quality control procedures to ensure the highest quality. The hull construction complies with or exceeds the Australian U.S.L. requirements. The hull is built in two parts and bonded together with sealed buoyancy compartments for maximum safety. Parallel automatic and manual bilge pumps are provided. A three point rubber cushioned landing pad system is fitted under the hull for operation off hard surfaces. Mustang is powered by a reliable General Motors, fuel injected V6 motor of 3.8 liters capacity. This engine is governed to deliver 123 kW at only 4200 RPM. Typical cruise speed for the engine is 3000 RPM to 3500 RPM resulting in a low fuel consumption of only 17 liters per hour when cruising. This smooth running engine combines excellent performance, durability, efficiency and low maintenance. The closed circuit cooling system incorporates aluminum water to air heat exchangers with high capacity hydraulically driven fans. The cooling system has been engineered for extreme climate operation. 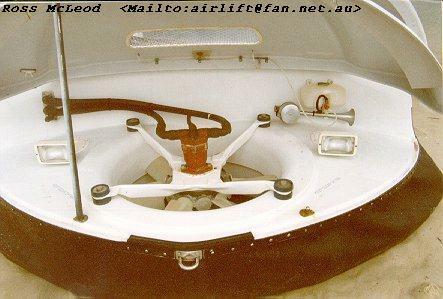 Propulsion is provided by two propellers mounted at the rear of the hovercraft and operating within aerodynamic fiberglass ducts as seen . on this image The propellers are of the wide blade slow speed type for quiet operation. Fixed pitch propellers are standard, however both adjustable pitch and variable pitch types are available to specification. 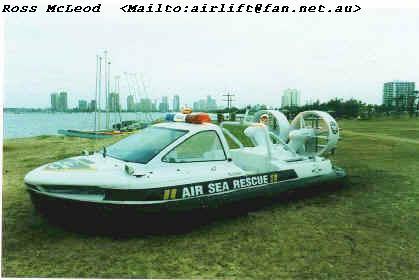 Propellers are manufactured by Airlift Hovercraft. Power transmission to the propellers is by shaft and toothed belts. An automatic clutch dis-engages at low speed to stop propeller rotation at engine idle for safety and to ensure smooth engine start/stop cycles. 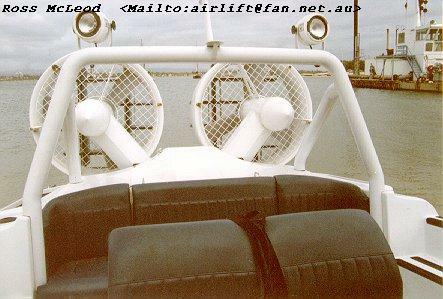 Lift is provided by an axial flow fan mounted directly under the bonnet at the front of the craft. It is driven by an low maintenance hydraulic motor. Oil is supplied to the hydraulic motor from a crankshaft driven variable displacement pump. An adjustable controller senses the lift fan speed and automatically adjusts the hydraulic pump out put to compensate for variable fan load and variable engine speed, thereby maintaining the fan at a pre-set constant speed. This unique system allows the operator to use more or less power for thrust as required without concern for over or under supply of lift air unlike constant ratio mechanical systems which must always compromise. 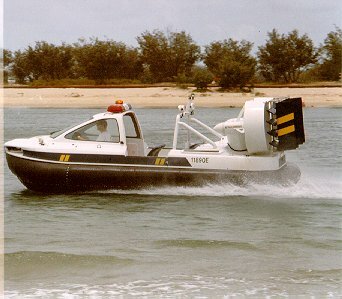 The hovercraft is therefore both easy to drive and efficient to operate. The hydraulic system parts are selected from world-wide manufacturers standard inventory. Service for this equipment can be provided by any local competent hydraulic serviceman. All fluids are S.A.E. specified and commonly available. A high rating ‘tropical’ cooling system is fitted to the hydraulic circuit. This system provides a simple and ergonomic crew interface to the control systems and integrates steering, pitch and roll control. All control systems have proportional hydraulic servo power assistance and incorporate aerodynamic rudders and elevators mounted in the thrust air stream. The propeller clutch is preset to operate at a safe engine speed to allow the 'Mustang' to hover for ground handling without the propellers running. 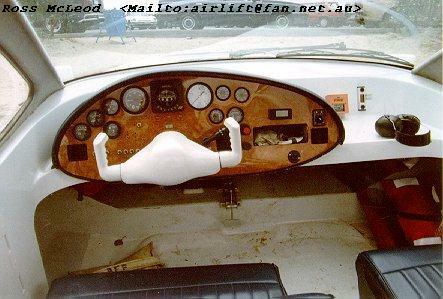 A foot operated throttle with hand operated over-ride controls the engine. Lift fan speed is pre-set by a small hand wheel on the dashboard. The skirt is a fully pressurized tapered bag and finger system. This skirt system provides the best hard structure clearance and stability due to the semi rigid nature of the pressurized bag, performance is outstanding in difficult conditions and rough weather. The fingers are bolted on with nylon fasteners and are easily changed without lifting the craft. Rubberized fabrics are of custom manufacture to optimize wear and durability. System voltage is nominally 12 volts DC. Power is generated by a 14 volt 85 amp engine mounted alternator. Circuits are protected by mil spec re-set able circuit breakers. Electrical cable is 105oC rated tinned copper and routed within conduits and fully sealed where appropriate. A windscreen wiper is provided for the front windscreen. A water reservoir with pump provides screen washing to the wiper. The wiper and washers are controlled by a column switch. The navigation lights comply with the requirements of the Australian U.S.L. code and international shipping regulations. Ample provision is made for accommodating communication and navigation aids. Other system voltages are available to special order. The engine bay is protected by a fire detection system operated from the control position. The cabin is equipped with a portable fire extinguisher. The internal surfaces of fire zones are treated with fire retarding finishes. The communications radio is normally an VHF marine type. UHF, HF, and 27 MHz radios may be fitted as well as a mobile telephone and an internal P.A. system if required. Compact marine radar and G.P.S.systems may be fitted according to the customer's specifications, provided it is compatible with the craft's electrical system. Rear cabin and gull wing doors. Wrap around low level windscreen assembly for use when front part of cabin is removed. Cold climate kit, cabin heater, screen de-misters, bigger battery, radiator freezing inhibitor. Arctic conversion, separate fueled cabin heater, smaller windows, de-icing equipment, cabin insulation, cold starting equipment, battery heaters, dual battery system. Marine VHF radio, 27Mhz radio, GPS, Cellular Phone. Storage cover, complete version, covers complete cabin and deck to top of skirt. Road trailer, complete flat deck with tilt for hover on and off.